This week we've seen it all. Ducks perched on the roof of an urban home. A robin, singing in a snow-covered tree (yes, it's winter again in Minnesota). A squirrel perched on our window box, eating some sunflower seeds. A fat rabbit sitting in the grass. All of these sights have made my own children gasp with delight. 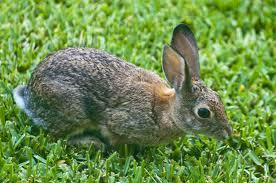 The other day J and I took a (much-needed) break from building Lego starfighters in his room and I glanced out the window to see a huge rabbit munching on the grass. As we watched, our noses pressed to the window, J whispered to me, "She's eating a lot of grass. She must like it here!" and "Aren't we lucky that rabbit came to our yard?" He was utterly captivated. As far as he was concerned, it was an honor to have our yard chosen by this rabbit. When the rabbit finally decided it was time to move on, J was at the window, and considered himself quite lucky to get to see the rabbit hopping away. "She's moving! Mommy, she's moving! Look at those legs go! I saw her white tail!" Indeed, how lucky we were. I love the way children so naturally slow down, notice the really special things. To an adult, seeing a rabbit in the yard is no big deal. Something that might inspire a smile, but not much more. Certainly not the focused atttention and rapt curiosity that J gave over. What a joy to be a part of his excitement, his delight and his intense awareness of this "other creature" that came and paid us a visit. He was so open to watching her, really watching her... noticing the little details in what she was doing, how she was moving, and every little element of her "rabbit-ness" -It might sound silly, but being shown a rabbit through the eyes of my son, I really felt like I saw a rabbit for the first time. "Do you think we'll ever see her again?" He asked quietly at the end of the day. He'd been thinking about this rabbit all day long. It really made an impression on him. "Maybe" I replied. "Maybe she'll be back." "I hope so." he said, "I hope so. We're so lucky she came here today." Virtual book tour update: please visit Lets Explore for the latest stop on the blog tour. What a wonderful resource for parents and caregivers-anyone who values play in all its forms. Thanks for stopping! It's not summertime yet, but oh, the livin' is easy. I'm told time and time again that letting children climb trees is one of the most difficult, stress-inducing, anxiety-producing things that parents or caregivers can be asked to do. I will begrudgingly admit that at times it can be very difficult to watch, worried that a child will fall and get hurt. It can be especially nerve-wracking if a child scrambles up a tree, higher than you the adult can reach, should the need arise. Yes, I understand that there are hard objects on the ground, onto which a child could fall. There are sharp-edged branches that can poke and scratch. Yes. I get it. But I always caution parents and caregivers-please, please step back and let the children climb. 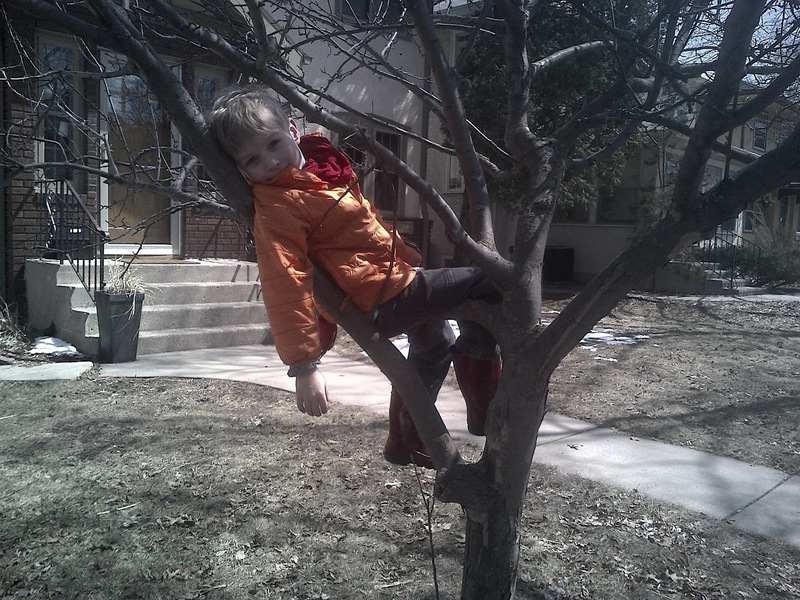 Climbing trees teaches children about risk and consequence.It teaches them what they can and can not trust their own bodies to do. If there is a scratch or a bump or a fall (and let's hope it's minor!) - most of the time, these events serve to teach children about their own physical limitations, and that they can recover from scary, sometimes painful accidents. Climbing requires them to really pay attention to their bodies in space: how they move, how much space they take up, how to get from one place to another. It teaches them to navigate and balance. To coordinate movements, to plan their next move. It challenges their confidence and their abilities. It tests their strength. It tests their courage ("wonder if I could get up to that branch there?") It gives them a new vantage point (really!) from which to see their world. And, it's just plain fun! 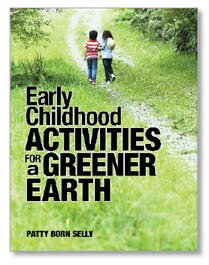 Tomorrow the "Early Childhood Activities for a Greener Earth" book will be highlighted on The Sellabit Mum, a charming and funny parenting blog from a mother right here in Minnesota. On May 1, you will want to check out Conscientious Confusion. a blog about green living and parenting. I'm so grateful for the support. "Welcome Ants!" -so reads the note scrawled in chalk on our neighborhood sidewalk. This afternoon I had the pleasure of watching a herd of several children create "protection zones" around a few anthills that have sprung up in the cracks in the sidewalk. 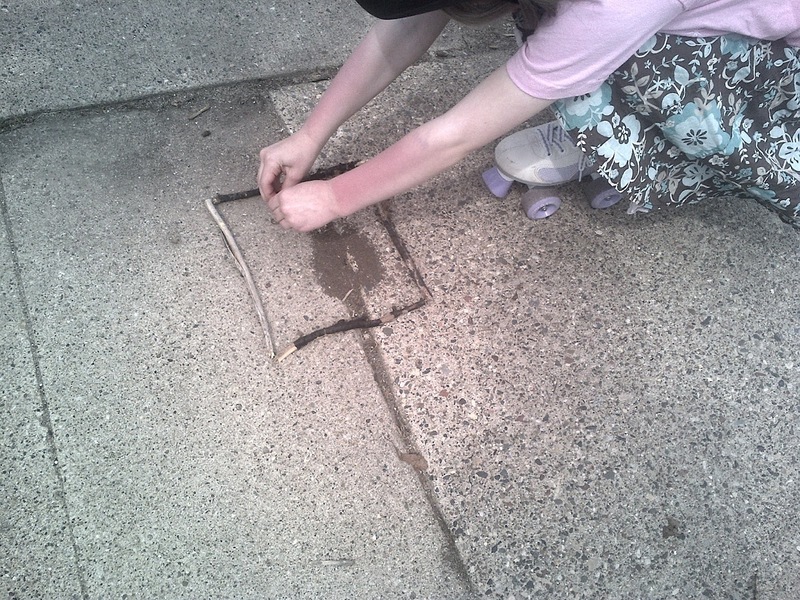 The children were so excited to see the activity of ants that they created stick barriers and barricades around the anthills to protect them from any wayward walkers or bikers. I believe in nurturing and supporting children's connections to animals whenever possible. To me, most of the time, that means getting out of the way. I didn't interfere with what they were doing, didn't tell them how or what or why to do anything, and certainly didn't pooh-pooh the idea. How tempting it can be for adults to direct what children are doing, to mock or dismiss simple acts such as these, or to try to make it "educational" by teaching them something about insects. None of that was necessary. 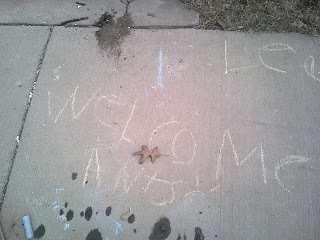 These kids were responding to a shared excitement and enthusiasm about ants, a shared joy that spring is finally here, and a shared desire to care for other living things. I didn't need to do anything to "help them"
Instead, I just watched. And what I saw! The kids, ranging in age from 3 to 9, squashed grapes and carefully laid them near the anthills. They covered the anthills with leaves to "protect them"
They held out flat pieces of mulch or leaves, let the ants crawl onto them, and gently placed the ants within the barricaded areas around the anthills. They even got out a wheelbarrow -a wheelbarrow!- and used it to transport ants from one end of the sidewalk to another. Children really do rise to the occasion when given the chance to respond to other living things with care and concern. They seem to have a universal love for animals, and an excitement about interacting with animals in whatever form that takes. Nurturing connections between children and animals can take many forms, anything from just asking a child questions to learn more about what he thinks of certain animals, to providing them with the tools necessary to care for an animal (such as a brush, leash, or water dish in need of filling). Certainly, it can even mean sharing in their joy and excitement when they welcome a new colony of ants to the neighborhood. 101 things to do with kids: #29 .....Celebrate National Screen-Free Week! I hope you'll subscribe to this page or check back daily. I'll be posting a daily suggestion for screen-free fun.